[Contest] Bluetooth Haiku! Oh Yeah! The deadline is May 4, 2008! That is ONE WEEK! Can be unrhymed BUT should you add rhyme, this will add bonus points. If you are a Dallas local, we’ll arrange a meeting location and I will exchange you the headset to your possession. The headset will be in as-is condition so any further damages will be the responsibility of your own. If you are not a Dallas local and you win, please contact me ASAP to arrange shipping information with me. You will be responsible for shipping charges. If there is a shipping option you’d like to opt for, let me know and front the cash. i WILL NOT BE SHIPPING TO COUNTRIES OUTSIDE THE USA! May the lulz be with you! PS – I will be posting ALL submitted haikus on announcing the winner. NEW ERRATA, DEADLINE EXTENDED!!! May 19th, 2008 by 12:00am! Let’s reflect on this… Bluetooth headsets have come a LONG way from their origins. I remember the days when Motorola was king in this sector because they helped a big part in the Bluetooth consortium with research and development. Their early headsets were also big and bulky and expensive to boot. When the standard was in it’s early days, it was a bit of a pain on the respect of distance as going just a wee bit too far could disconnect your calls. When the standard got better, so did the devices… But this also opened up the playing field to manufacturers who wanted a piece of the land for Bluetooth accessories. Nowadays, you have many manufacturers like Nokia, Sony Ericsson, Samsung, LG, et al who make headsets as well as phones for direct compatibility with their devices. However, you have your “generic” manufacturers such as Jabra, Plantronics, and a few others who make your general consumer models and then barely stepping into the high end of the spectrum. Lastly, you have the big contenders on the “high end”: Callpod Dragon, Aliph Jawbone, and BlueAnt Z9. The Callpod Dragon just doesn’t look fashionable, so it is omitted for this review… However, the other two are quite possibly the more “chic” in the high end. Click the images to expand them! 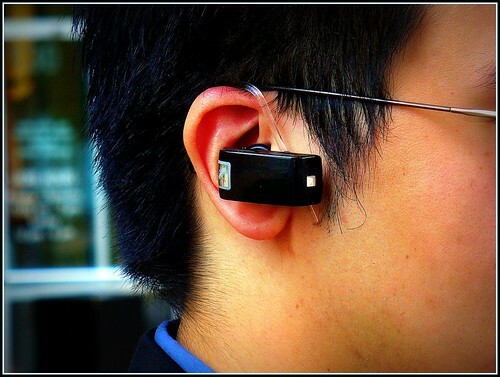 The Aliph Jawbone is a rather “futuristic” looking headset. It has a wicked sick looking mesh grating design with a rather simple red or white LED flash from the status bar. The design is from Yves Behar who has a large vested interest in the headset. It’s rather large but the design is functional to the means of the headset’s calculation of vocal activity. To secure it to your ear, you do have a few ear loops and “gel” inserts to change the headset to accommodate your ear size and shape of your ear canal. The Jawbone keeps function simple with just 2 buttons, one on the mesh and the other on the “Jawbone” embellishment close to the charger port. The Australian company BlueAnt has been a minor player with budget models and other unique niche headsets (like their motorcycle helmet communicator system). The BlueAnt Z9 comes as a contender to the Jawbone in the vectors of style and size. This headset isn’t designed with a legendary designer, but it certainly looks quite sleek or even covert. The mounting system is a fixed rubber ear cushion and an adjustable plastic ear hook that can rotate and fit to the ear. There is also a clip on the headset for times that you may not feel the need to wear it constantly, definitely a nice touch! In this review, I have a guest reviewer as well to give the female side of her input on the comfort of the headsets as well as her thoughts. Stephanie’s input will be included for posterity of the review. This will help females consider which may be best in terms of their comfort. Also, please give a hand to Stephanie for taking the images of me “modeling” the headsets. I would also like to thank my cousin Sol for being my test caller and allowing me the privilege to subject him to calls and use his feedback for call quality. Also, I’d like to thank Yamcha of Wolf’s Hurricane for his insight on my contest that will be posted online after this post! Bluetooth is becoming more popular now with how some countries and even some states in America are cracking down on irresponsible drivers who choose to pinch a phone to their head while not putting full attention to the road. In the UK, if you kill someone in an accident and you were on your mobile phone… The justice system over there can impose severe penalties for such an infraction. At the same time, no one wants to look unfashionable for having a headset almost looking like some “ugly” device growing off the side of our ear or looking like a “bluetool” (vernacular). I would like to begin with the Jawbone first, but let’s go over the logistics of the things I used for the review. The Jawbone has won many awards for being both fashionable and revolutionary from a technological standpoint. In Dallas, I have seen many people adorn their ears with the Jawbone so after seeing the rave reviews, I picked one up just to give it a test drive and play with it. The Jawbone’s sizing solution is kind of unique. Aliph gives you 4 ear loops in 2 sizes and for the left and right ears. You get a pair “regular” size and a pair “large” size ear loops. In addition, There are 4 contour ear bud gels that are included in the package to go with the shape of your ear canal. two of them are a variation of a “teardrop” shape and curve right to the ear canal, while the other two are large and small versions of a circular ear bud gel. I personally have small ears so I honestly had trouble with both the “regular” and “large” ear loops and the ear gels of all types didn’t help the unit stick to my ear. However, when the unit is not moving from my ear, it fits rather nicely and comfortably. I will comment that the build quality is EXCELLENT! The principle behind the Jawbone is a rather simple one. The device has a rubber nub that detects movement from your jaw (hence the name) and translates that as actual activity. 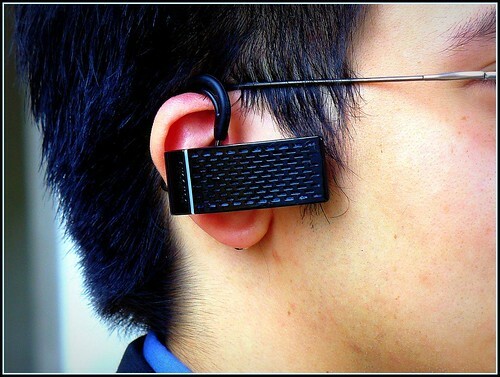 This lets the headset know you are actively conversing. On top of that, the headset also has active noise canceling to assist with making clear communications. The unit has two buttons as aforementioned earlier on the embossing of the word “Jawbone” and another on the mesh part of the headset. The “Jawbone” button functions as the “pairing mode” button and during calls it acts as a “volume” button of sorts. The primary button on the mesh is your main power/call answer/end call/etc button. There’s also a very subtle LED on the unit that blinks white when the unit is in use (rather than the typical blue), red when the unit is low on power, solid red on charging, and solid white on a full charge. The tactile feedback from the unit is pretty good but it does take a little effort. On bonding with the unit, it would bind to my HTC Kaiser rather quickly. I would do some random test calls with the Jawbone just to see how well the noise cancel and fit would work with me. I took my MX-5 for a drive with the top up and tried to use Voice Command to ask it to dial out and then proceed with a phone call. On idle, the headset could properly connect and accept my commands properly. The call quality was pretty good with minimal interference. Throwing town the top however would change the dynamics of the test… Voice Command had serious trouble reading my speech as the headset had some issues trying to determine whether I was talking or not with the the rubber nub breaking contact from my jaw line every other second from the aerodynamic forces of wind. That was the big issue that makes the device fit for people with small ears like me… The headset almost fell off my ear a few times during this test. I would be running speeds of 40 – 70mph in my car with the top down to be fair. Most of the past week has been windy, so I also tried to see if gusty 10 – 15 mph winds were also a problem with walking around Dallas… and sadly, the headset also had a bit of a problem reading my speech due to the headset not fitting flush to my face. Some of the test calls with my cousin Sol and he would report that there were some sound issues with noise when I had the Jawbone during my wind tests. However, during my tests in the office of ZeroXR 13mg there were some troubles from the noise cancel due to the fit of the headset. That leads us to the only gripe I have with the headset… The fit is not friendly to those with small ears… I tried to contact Aliph about this, but so far they have not responded to me. Though some folks on line have reported that buying some Jabra branded ear gels help, but that’s a bit of a shame that Aliph has forgotten the fact that a generic fit solution does end up “discriminating” a part of a demographic. I did ask for Stephanie’s opinion on the Jawbone and she had no problem with the headset’s fit. She had commented it was really comfortable for her. Though she did make a comment she like big devices as it give her a tactile feel that is a little more reassuring. She was wearing the standard ear bud gel with a regular sized ear loop. She’s fortunate that it fit perfectly for her. I will comment that the headset is really comfortable that you almost forget that you’re wearing it. Sadly for owning small ears, the fit isn’t perfect for such a wonderful headset. Due to that, the noise detecting rubber nub on the headset couldn’t accurately read my vocal speech. The volume is also semi-dependent on the background noise. The BlueAnt Z9 is a small name headset that has been making some circles as a rather great alternative for those who do want an alternative because the Jawbone was simply not their cup of tea. The Z9 is a tiny piece of hardware equipped with a proprietary port that’s used for charging the unit and also upgrading the firmware. (I’ll talk about the upgrading part later) The design is tiny with a few “bling” spots of chrome on the device for style accents. The device is equipped with 2 microphones to analyze sound waves and process vocal data and noise data to effectively neutralize noise and improve the call quality. The Z9 has 3 buttons, the MFB (multi-function button) and a volume + and – button. If you want to go “stealth” and not have the bluetooth blink, you can hold the volume + and – buttons for 3 seconds when the headset is idle to turn the blink off. Something nice to not draw attention to yourself in dark places. They all have a great tactile click when you press them. BlueAnt does give you a tiny business card sized reference sheet for you to get oriented, so it’s rather nice if you need a pocket reference. Unlike the Jawbone, the BlueAnt Z9 takes a different approach to fitting to the user. The headset has a plastic ear loop that looks like a plastic scythe mounted to a rubber rotating nub. The plastic hook does have some resistance to the plastic nub, so you can adjust the fit of the headset by moving the hook higher or lower from the nub to make the headset fit more snug. This combined with the rubbery ear cushion, the BlueAnt Z9 feels like it’s securely locked to your ear. While this gives the BlueAnt Z9 a definite plus for people with small ears, the fact that it is not made of a flexible yet sturdy plastic is also somewhat of a concern. It is great that BlueAnt included 2 more ear hooks, but I’d rather they were made of a more sturdy material like the metal with rubber padding like the Jawbone. Pairing and linking the BlueAnt Z9 was rather painless and quick. The best part was that you’re not subjected to a long and annoying beep while the headset pairs up. Just a quick beep that tells you “I’m bonded!” The manual mentions that the Z9 can bond to 3 devices, sadly, I couldn’t test that so I cannot offer any insight there. The multi-function button (MFB for short) serves many of the primary uses of the headset from powering it on to essential functions like changing the noise cancellation modes. However… it makes ending calls a bit awkward. Most headsets answer and end calls with one click… The BlueAnt Z9 picks up calls with a click, however when you’re on the call and click on the MFB… You hear an auditory voice saying “Voice Isolation MAX” or “Voice Isolation Standard” indicating the level of voice isolation. To end a call, you have to hold the MFB for 3 seconds and you then hear a beep indicating the call has been severed. For many Bluetooth veteran users, it sort-of causes a mix up. It does take some getting used to, but it does make you wonder why the voice isolation was not remapped in another way. I naturally downloaded the firmware update and proceeded to follow the simple steps to get the drivers installed for the headset and then the update was just a simple drop and go process. After the update, I was really anxious to see if the improved voice isolation algorithms would enhance things even more… as the firmware notes from v3.0 to v3.4 were rather significant. That would lead to Saturday and walking around town while trying to find the ideal noisy environment to make my test call to Sol… and I found the best moment. I was down in West End walking around down… a Hummer limo with a bunch of boys in white t-shirts saw some ghetto girls and told the driver to pump up the tunes while they would pop their heads out to give a shout to the girls. I happened to place a call to Sol at that moment… and the call was remarkably clear! The headset also adjusted the volume automatically adjusted to the environment helping clarity by a good degree. I had the voice isolation on the MAX setting and it really made things great! The volume buttons do actually work on top of the volume adjustment from the dual microphones automatically working, just in case if that’s not enough to break through the noise. I was simply impressed that I didn’t have to mess around with the headsets fit just to make sure that my speech was coming in clearly from motion detection. The headset’s tight fit and dual microphones helped make that “extreme” test call work just perfectly! On asking Stephanie’s opinion of the fit of the BlueAnt Z9, she said it was a rather tight and rigid fit. Her opinion was based on the hard plastic ear hook and the difficult system on adjusting the size without breaking the delicate ear hook. She did comment that the tiny size was interesting, however not her forte. The comfort of the headset does take some experimenting to get good with, but once you get it perfect… the headset is almost weightless! It’s not as “perfect” like the Jawbone, but at least it sticks to my head… I will remind readers I do have small ears, be warned. From this… I think I have my winner. The BlueAnt Z9 does win from a good snug fit, great noise isolation, and most of all it has a small foot print. The headset is almost weightless and provides great and clear calls! It is stylish, but however from using a rigid plastic ear hook… it is a minor sacrifice in comfort to have the headset be planted on your head. If the Jawbone had a small ear loop that provided a proper fit for the small folks, it would have been even harder to choose a winner. The ability to upgrade the BlueAnt Z9 gives it more points as the headset still has chances to become better rather than a “Version 2” to hit retail and you to be stuck with an obsolete headset. For people who have small ears, but want a headset that looks great and performs beautifully… I highly recommend the BlueAnt Z9. I need some volunteers today to call my phone with my BlueAnt Z9 on me. I am going to some noisy urban environments and it’s to test the noise cancel. I have unlimited weekends, so do your worst! Well, it’s a lovely weekend and I could use a good end to a chapter of my life. 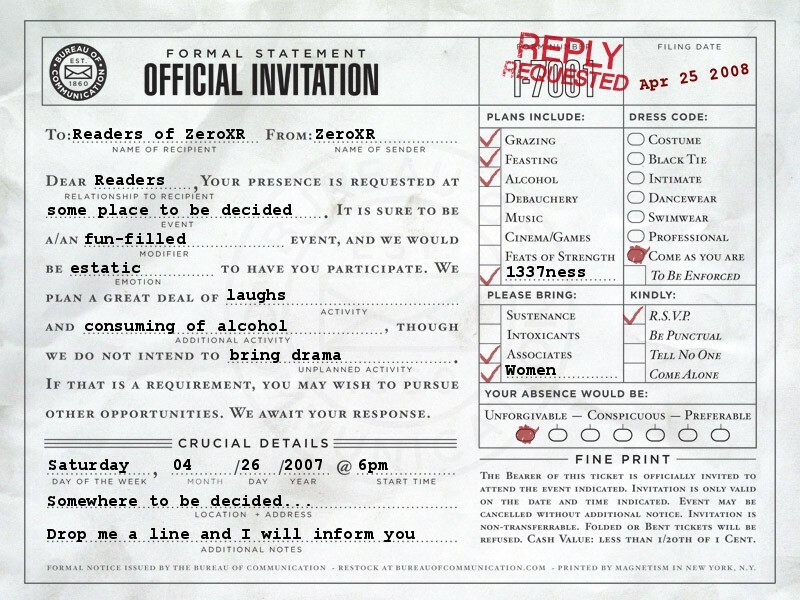 I invite you all to hang out with me and just be yourselves and possibly mingle with each other… Here’s the formal “invitation” form, click it to view it in its glory. If you have my contact data, gimme a call and maybe we can all converge at one place. If no one responds, no big deal… no hurt feelings here. It’s funny when you factor in the latest paycheck and then take in to respect that the last 2 paychecks have almost been suffocating you when you put into perspective that you may have spent a little too much on going out to eat rather than bucking up to just packing lunch. I know that I have had personal problems basically bother me to death, so I need to keep watch on my spending this round or waiting for my next check will be like a halo choking me. I may hold off on some nice bluetooth stereo headphones for the gym until next check… Hopefully then I can nab it and resume banging out to tunes and being able to catch calls while lifting weights. I have decided to try to enlist the help of Mint and Xpenser to try monitoring and tracking my expenses. I am more curious to see how the next month’s expenditures will go. Mint is a great financial tool as it can analyze your transactions and even do trend reports over your spending habits by linking to your bank accounts and/or credit cards. The site is SSL encrypted and it does mask off your account numbers in case someone decides to try glance over your shoulder. It’s pretty cool as you can analyze your transactions and see where a bulk of your cash goes or the site can even recommend better credit cards that could be better than the ones you have. Scary thing is most of my cash is going to my car note and Wal-Mart… not “shopping”, dining, or drinking. That alone is shocking. Xpenser is a different tool. It’s more of an expense log to allow you to invoice your purchases to see how your budgeting is going. It’s great for when you don’t want to hold on to that receipt of yours just to log it. Xpenser is pretty slick as you can make “invoices” via the web application from the website, send an IM via AIM, call with a phone, or even text message! I am going to give it a try for a month and see how much it can help me curb my spending and help me repay my family faster. I also managed to find the advice I need and I may just have the craziest plan ever… I can’t WAIT for May 21st! Punishment Game II – Crunches until I could crunch no more. I let the Avenged Sevenfold single “Warmness of the Soul” play on Suzaku while I did my second punishment game on working out to failure. The full sit-ups were great but the crunches throughly wore me out. The last one I could muster before I just plain couldn’t trudge along anymore were the jack-knife sit-ups. I think the exhaustion from the crunches setting in killed me. I finally was wore the hell out. Tomorrow, I have plans for Punishment Game III and the target will be my arms and chest. My body will hate me, but when the muscle grows even larger, I don’t think they’ll mind me amping up the challenge. I worked my quads pretty hard last night, so I expect them to be pretty sore by tonight. Tonight, I have another punishment game lined up for tonight, this time… I am moving the target zone up. It’ll be an ab crunch cycle until I just plain can’t do any more. Right now I can’t go to the gym from watching the mileage on my car… so gravity or manual work outs are my best bet until I get my car done. With the Dallas humidity, it’s damn near driven me insane that I can’t sleep without tossing and turning. I got so bothered by the heat that even an icy cold shower didn’t do the trick. My last shot was to exhaust myself to doing squats on the pure force of gravity on myself and my own body weight. I have managed to do quite a number of them so I am rather tired… Hopefully this will spur the needed stimuli for me to break out of my plateau. 2am and my quadriceps are basically begging for death… I can finally sleep now.